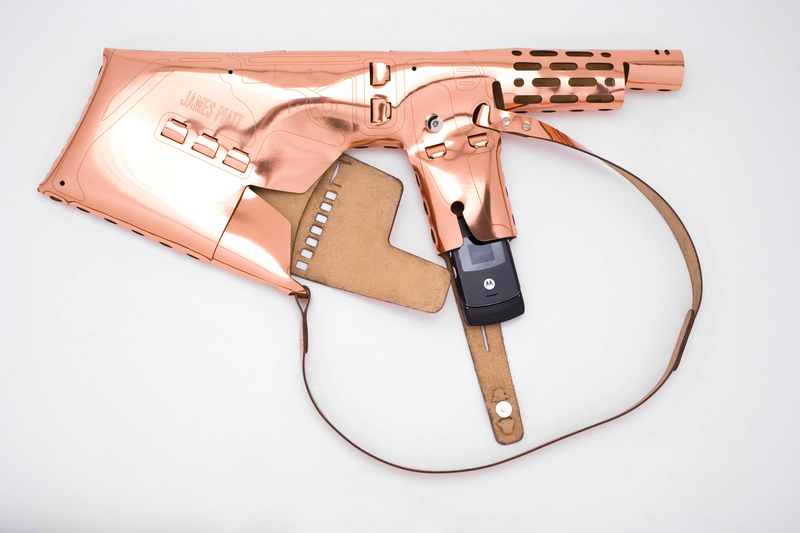 A somewhat more fashionable Kalashnikov: “Pursuader” from 2007 by James Piatt. The title itself, “Fire & Forget”, already represents a challenge. On the one hand it draws our attention to the fact that without even thinking about the horrifying consequences, even in war shots are just fired, this makes one hell of a noise, and happens using extremely functional and for the most part also attractively designed weapons. A computer game on display excellently demonstrates precisely this; there is shooting, which actually goes on all the time, but whereas in almost all games those playing it happily fire in all directions, the resulting bodies, often hundreds of them, disappearing immediately, and no longer popping up on the screen, in this game they remain there, bleeding and piling up on top of one another. To a certain extent the game turns out to be more serious; here, virtual action becoming twisted with everyday life. On the other, it is to be feared that at least some enthusiastic gamers may find such highly realistic looking piles of bodies even more exciting. Horror is always, to a greater or lesser extent, associated with fascination (a word that is not immediately reminiscent of fascism). It is a connection which is used just as much lucratively as it is banally by many a form of martial art and music, and bunker architecture, and, it goes without saying, by design as well. Several products such as these are on show here: the table lamp by Philippe Starck, the stand of which is a weapon (very expensive and very successful in the market); jewelry, not to mention an “ecstasy” pill and handbags by Alexander McQueen in the shape of grenades or knuckle-dusters (to grace female fingers), not to mention, of course, military-looking clothing. Next to it there are likewise expensive sneakers by Adidas and Nike; in the case of the latter the camouflage used by a particular army has been worked into the shoe as an attraction. Finally, in a separate space, there are three large video projections: A practical presentation of tanks in motion, driving around very plausibly like toys at a children’s birthday party, advertising clips for the famous company “Heckler & Koch”, in which there is a lot of shooting; and an advertising clip for the German Navy (co-directed, incidentally, by Peter Schmidt Studio, which is otherwise known for designing elegant perfume bottles ). In the latter, a person talks about his love of bananas, ships then appear, and we learn something about the relevance of the global trade that crosses the oceans, then some talk about the security required, a look through a telescope, suddenly there are shots from cannons, and rockets, as a result two people in the water, clinging to ship planks. Great satire, albeit it inadvertently. Explosive tree decorations: “Dorothy XMAS Declarations. 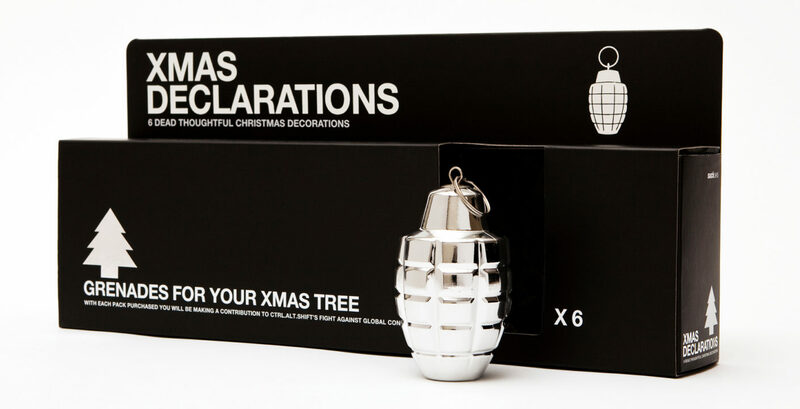 Grenades for your xmas tree” from 2009. 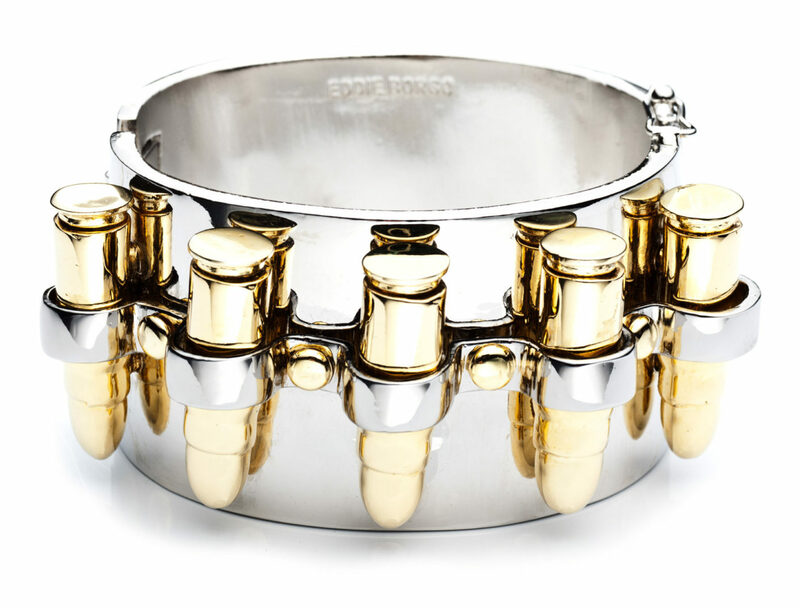 Bracelet for heavy guns: “Bullet Cuff” with cartridge cases by Eddie Borgo (2011). For example the work entitled “Cloud Faces” by the two Korean artists Shinseungback and Kimyonghun: Small celestial colored images of clouds shine beautifully from the wall; these are clouds that have been altered slightly digitally, such that drones fitted with face recognition software that is nowadays standard for military use see the clouds as faces and would shoot rockets at them. This is very realistic, after all cars have already been targeted by drones such as these, because with their two headlights and the front grille they frequently resemble faces when viewed head-on. Then there’s the installation “Tin Soldiers” by Israeli artist Ala Younis, in which she arranges thousands of correspondingly decorated toy soldiers by the size of the relevant armies, setting them up in strict order, while explaining that wars are now fought quite differently, the soldiers are mere figures, which somebody or other deploys here and there and, if necessary, sacrifices. 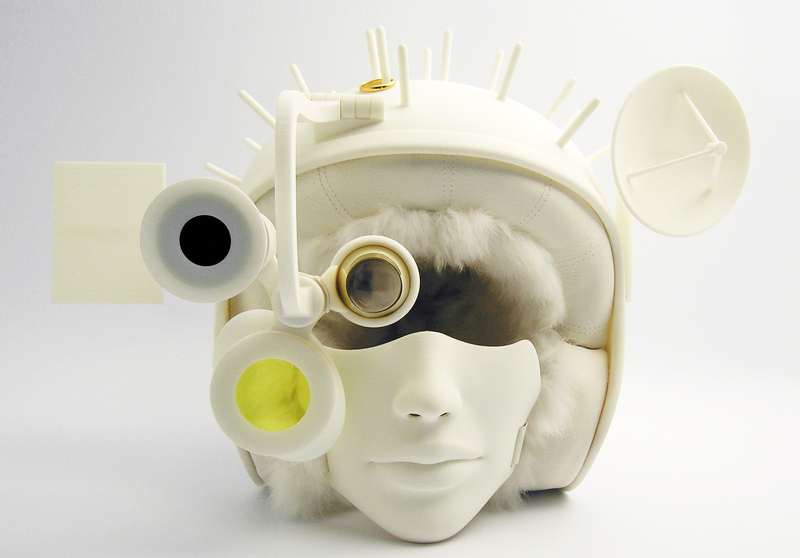 No end to body extensions: “Trophy Helmet” from the series “7 Necessities” by Ted Noten from 2012. Perfect gear for the long night: 3D-printed pistol case “YSL001” from the series “7 Necessities” by Ted Noten. All this is moving, and at the same time challenges us to address the topic. Most forcefully, without doubt, the work entitled “Double Shooting” by Rabih Mroué: On a wall, 70 video stills are mounted one behind the other and at such an angle to the wall that walking along it (you should do so within the space of 15 seconds), you experience the movements as if this were a film. You become the person who actually made the video, and are confronted with a view of what is clearly an enemy soldier, who initially cautiously looks over from the ruins of buildings, pulls back startled, as it were, before re-appearing and, at the sight of an opposing force armed just with a camera, takes position, raises his weapon, rams his left-hand leg firmly into the ground in front of him, takes aim, fires, and hits his target. Walking along and witnessing this is shocking – especially at the last but one image, because it is precisely then that the shot rings out. We might still be alive, but the person who “shot” the video is not. 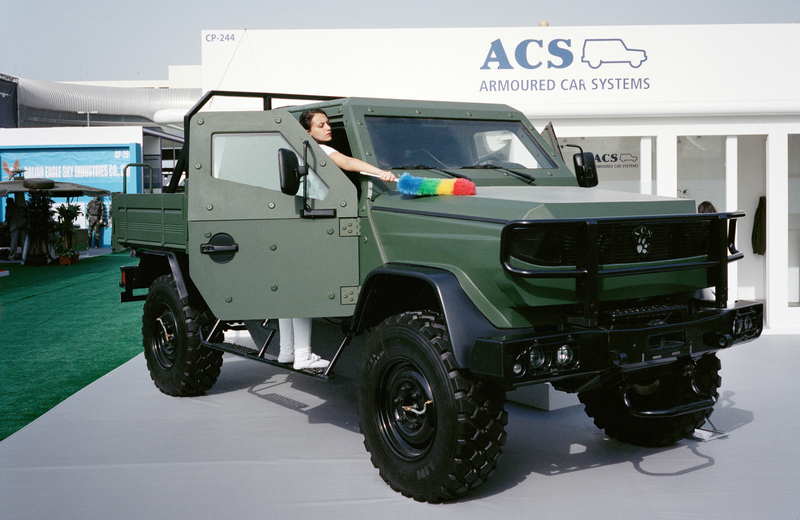 There is something of an armored vehicle in every SUV: In the photographs of the series “World of Warfare” Julian Röder casts a glance at the showrooms of the weapons fair “DEX – International Defence Exhibition and Conference” in Dubai. So this is an important and extremely cleverly arranged exhibition. With an unusual catalog, which, although it unfortunately does not document all the works on display and the artists, is nonetheless extremely impressively designed in the form of a fashion magazine and has intelligent articles. However, precisely clever exhibitions provoke criticism. 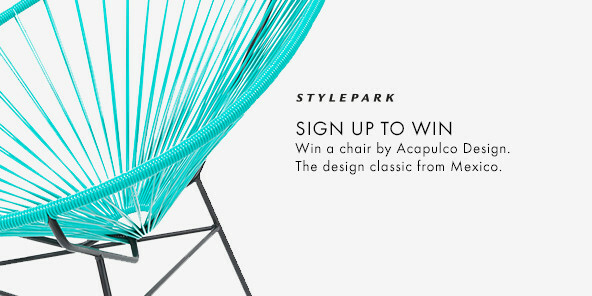 In this case it is a little regrettable that the utterly indispensable ambivalence of design is not presented and explained more clearly. Because one thing is for certain: Almost every object (as well as a number of symbols and services) is suitable as a murder weapon. Even a paper clip or an exquisitely designed scarf, every car and likewise airplanes. Furthermore, every SUV represents a liking of the military. Extension of this nature to normality via art would have done the exhibition a lot of good. But that can still come. with articles by Olaf Arndt, Richard Brem, Klaus Günther, Andreas Hofbauer and Barbara Vinken, and previously unpublished notes by Friedrich Kittler for a seminar about “Literature and War”. 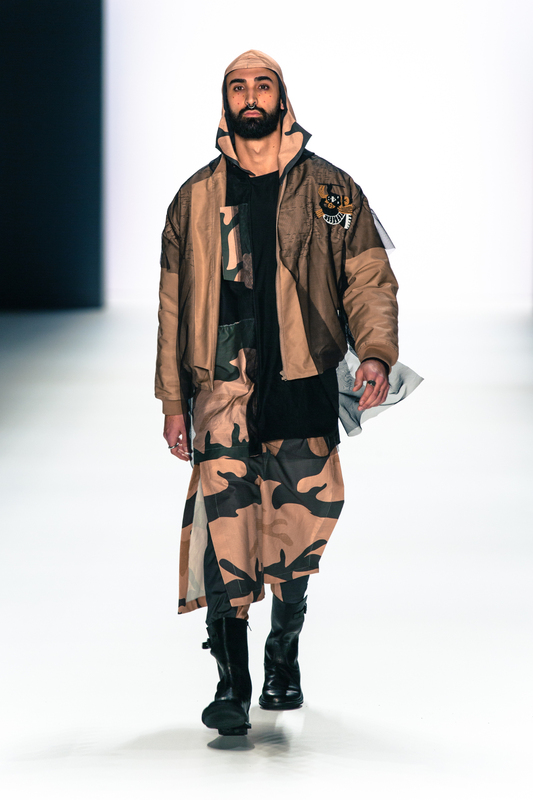 Camouflage for the fashion-conscious man, from the 2016 Winter collection by “Sadak”, the label of Serbian fashion designer Sasa Kovacevi. 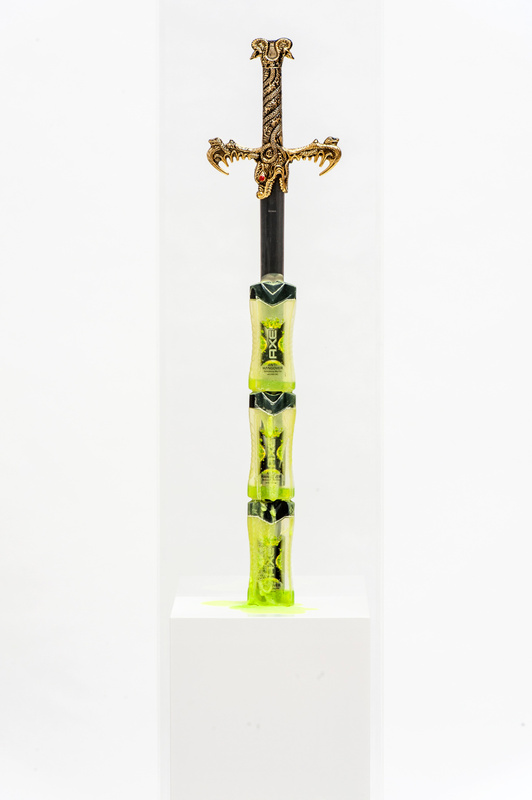 Neon-yellow blood on the trophy: “Axe Effect” from the sculpture series by Timur Si-Qin (2011). 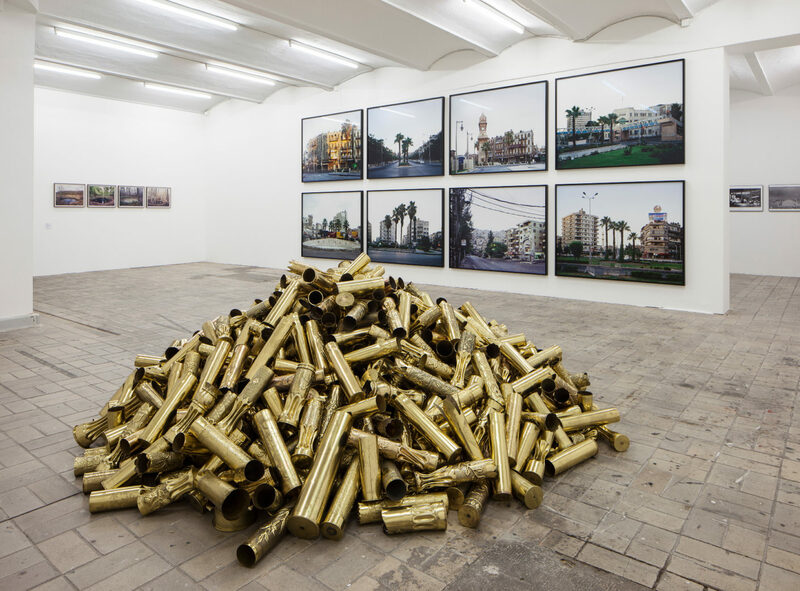 XL cartridge cases or just decorative metal pipes? Installation by Kris Martin from 2010. 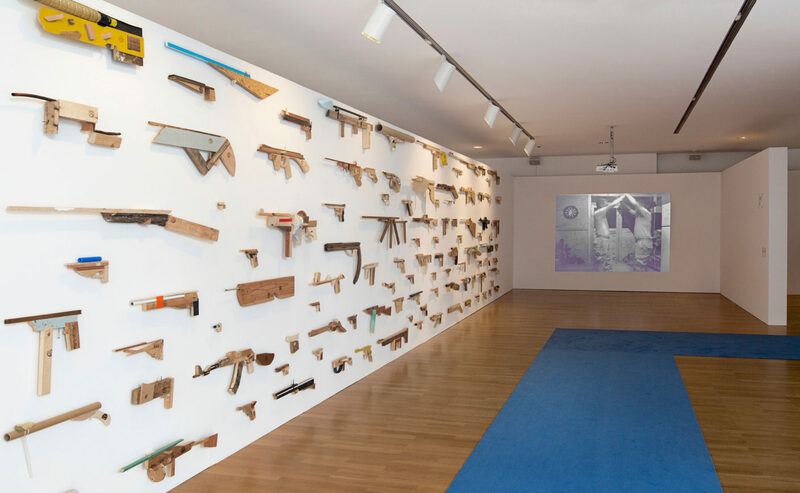 Masses of weapon models in wood: “Guns”, reproduced by Robbert&Frank Frank&Robbert from 2014. 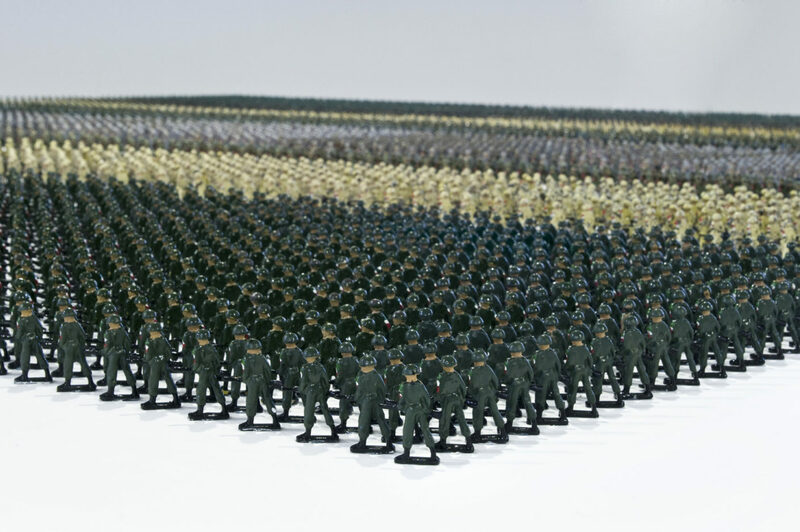 Battalions reporting: Toy “Tin Soldiers” from 2010 by Ala Younis.